Cheating operation allegedly went on for five years as educators "perpetuated a culture of cheating"
For five years, teachers and the principal of a Philadelphia elementary school allegedly engaged in an cheating operation to raise test scores for a state standardized exam, Pennsylvania's top prosecutor said on Thursday morning. NBC10 Investigator Harry Hairston went to the school district with questions regarding an elementary school cheating scandal. Five educators -- four teachers and their principal -- at Cayuga Elementary School in the Hunting Park section of the city allegedly changed or provided answers to students and reviewed test questions for the Pennsylvania System of School Assessment (PSSA) before giving the exam, according to Pa. Attorney General Kathleen Kane. "Cheating robs children of a good education and hurts kids and families," Kane said in a statement. "The alleged misconduct by these educators is an affront to the public's trust and will not be tolerated." Cortez "blatantly promoted" the act over the PA system at the nearly 450 student school, the AG's Office said. 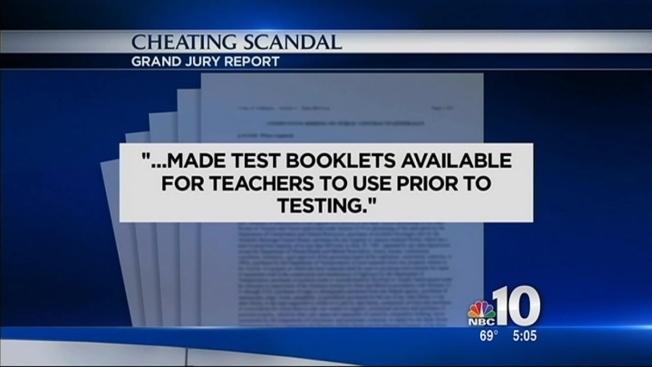 Prosecutors said the grand jury also found the principal allegedly walked through classrooms during the testing, looked over students' shoulders and tapped their test booklet to indicate the answer needed to be changed. Testifying before the grand jury, one teacher said Wyszynski admitted she, Sloane and Cortez would at times come into school on Saturday and change test answers, a grand jury report stated. The high test scores led to accolades from district officials and even a promotion for Sloan, who became the principal of another district school. Once the alleged cheating stopped in 2012, prosecutors say the school's PSSA scores plummeted across all grades and subjects. According to the School District of Philadelphia, math PSSA test scores for 3rd grade Cayuga students dropped from 63 percent to 30 percent from 2011 to 2012 -- when the alleged cheating ended. Reading scores for the same grade went from 60 percent to 27 percent in the same period. In the 4th grade, math scores dropped from 77 percent to 39 percent and reading scores went from 42 percent to 19 percent, according to the records. PHOTO: Cayuga Elementary School at 5th and W. Cayuga Streets was the scene of alleged prolonged cheating scandal perpetuated by educators. 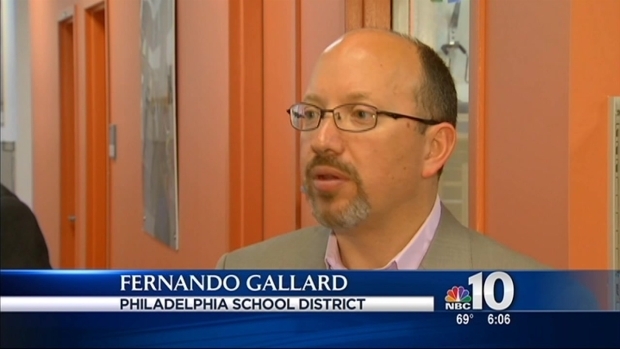 School District of Philadelphia spokesman Fernando Gallard said the charges stem from 2011 investigation conducted by the Pa. Department of Education and state Inspector General. Officials looked at suspicious PSSA results at 11 district schools and 3 charter schools as well as other schools across the Commonwealth. The grand jury presentment said the test results and number of answer changes were statistically improbable. "The five individuals criminally charged today were immediately suspended from their current duties pending a disciplinary conference to be scheduled in the near future," Gallard said in a statement. The district changed its test security procedures in early 2012, Gallard said. Jerry Jordan, head of the Philadelphia Federation of Teachers, said it was the teachers who blew the whistle on the problem. Still, he admonished their alleged actions. "There is no place for cheating when it comes to educating our children. As educators we teach our students that they have to work hard to be successful," he said. All five of the educators turned themselves in to Philadelphia Police's Northeast Detective Division on Thursday morning. Cortez's attorney, Matthew Sedacca, told NBC10.com that his client contends "the charges are not true." "She is denying these allegations and we are going to fight them. We have not seen any of the paperwork that has been presented by the Attorney General's Office," he said. Hughes' attorney, Leno Thomas, said his client is innocent. "We look forward to defending in court vigorously." The AG's Office said their statewide investigation is ongoing signaling that more could be charged in Philadelphia and elsewhere in the future. Philadelphia isn't the first major school district to be embroiled in a test cheating scandal. Districts in Washington, D.C., Atlanta, Ga. and Houston, TX have all been under investigation for similar accusations.